Today's surveillance systems demand 24/7 effectiveness. A complete range of infrared and visible white light illumination from security lighting specialists Derwent Systems is now available from Bosch. 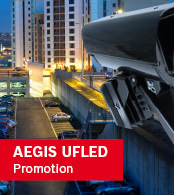 Featuring innovative lighting technology and installation friendly design, Bosch illuminators are designed for long life, high reliability and low maintenance and are field proven in critical security applications worldwide to enable unrivalled night-time surveillance.